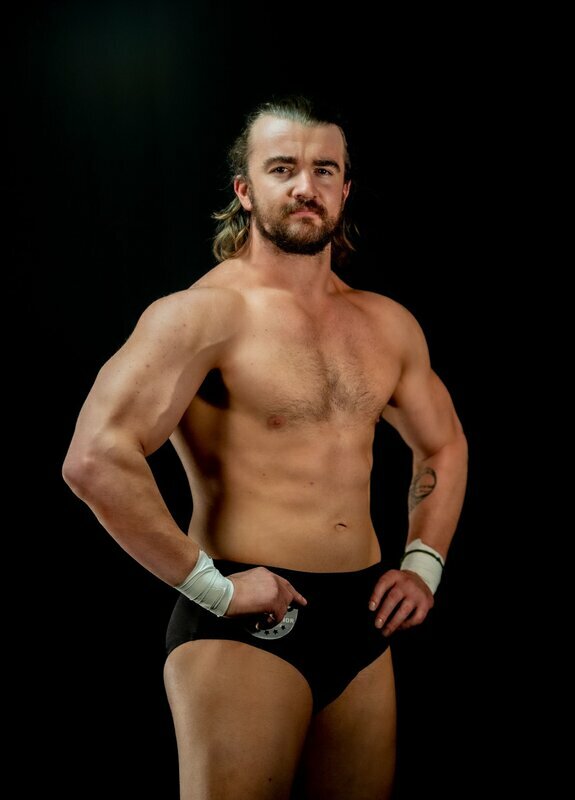 NOAH's is "reborn" with a new owner and no use of NJPW talent! Yoshinari Ogawa (Rat Boy) vs Hitoshi Kumano. Yoshinari Ogawa (Rat Boy) vs Hitoshi Kumano. This card kicks off with a long time vet in Ogawa against a young lion with promise, Kumano. The vet gets the win but he had to deliver a huge beating to Kumano to get it. After the match, Ogawa rams Kumano into the steel railing and walks off with an attitude, leaving the Young Lion in pain, and being tended to by the Noah Staff. Alejandro Saez (left) is profiled on WWE's website since being part of the Cruiser Weight Classic. He's an amazing wrestler, that works best as a heel, which is what he does for Noah. Hi69 (right) was a freelance wrestler but greatly impressed Noah's owner/president, Masayuki Uchida and was offered a full time contract with the promotion. This was a great match that saw Saez get frustrated numerous times as Hi69 took everything he had and battled back until Saez hit a twisting senton off the top rope for the win. Daisuke Harada (left) a major star in the Junior division, and a tag team specialist for years, he performed a lot in CHIKARA and had a strong following there. Kaito Kiyomiya (right), a promising Young Lion always works well but hasn't gotten many victories as of yet and frustration seems to be mounting for the young man. ​Kiyomiya started like a house on fire, tearing into Harada, but the veteran fought back and we had an excellent match on our hands, that spilled outside the ring for some time. Harada puts the determined Kiyomiya away with a high arching and bridging german suplex. Akitoshi Saito & Mohammed Yone(on the left), two long time vets and NOAH stars face a tag team that seems to have had some tensions as of late as Kenou doesn't seem overly happy with his partner Masa Kitamiya, possibly because he's been contending for the GHC heavyweight singles championship and Kenou seems to have his sights and focus on the heavyweight tag titles. Kenou proves his desires by crushing Saito with a brutal double foot stomp from the top rope! 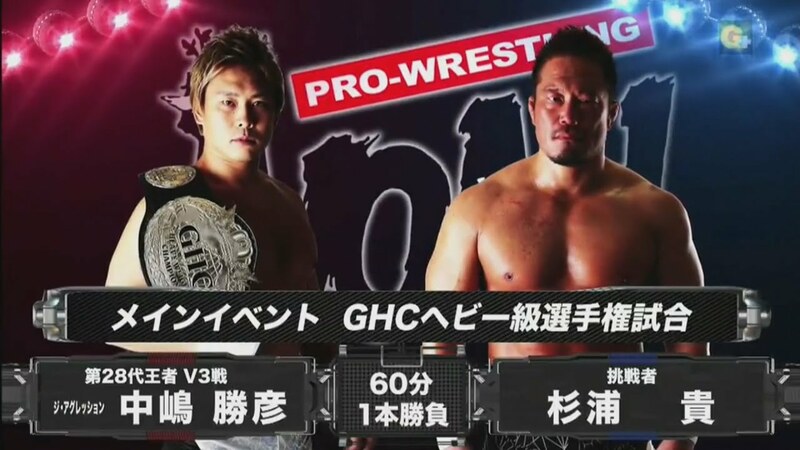 For the vacant GHC Junior Heavyweight Title, after being forfeited by Atsushi Kotoge, as he chose to enter the heavyweight division, this would be Taiji Ishimori (left) vs. Hajime Ohara (right). 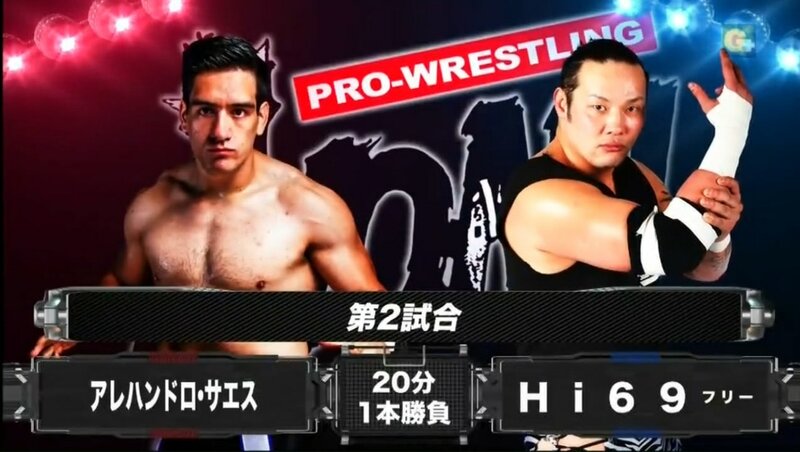 Ohara would win an excellent match up and Ishimori would move on to the tag team division and find great success with Hi69 as future show will reveal! 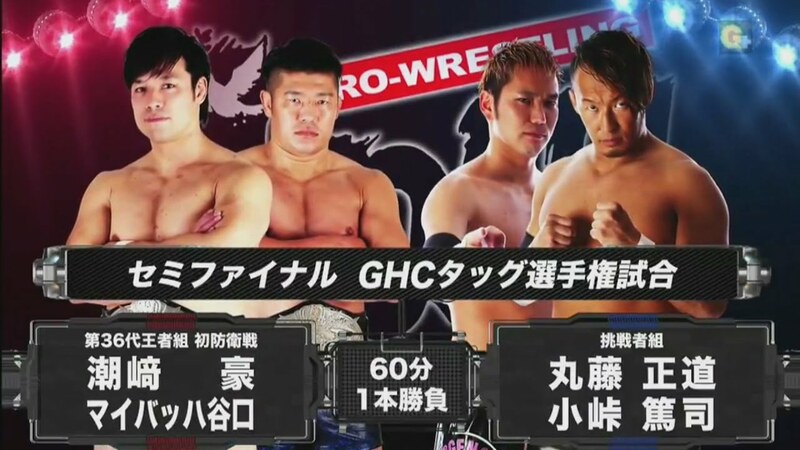 In a brutal war for the GHC Heavyweight tag titles, the champions Shiozaki and Taniguchi battled Noah's "ace" Naomichi Marufuji and his partner, Atsushi Kotoge who had just forfeited his GHC Junior Heavyweight title to enter the ranks of the full heavyweights. 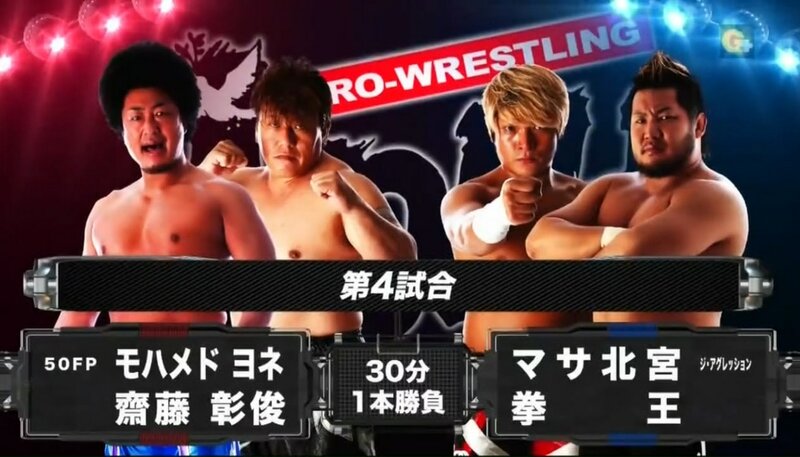 These are four of the best wrestlers in not only NOAH, but Japan, and possibly the world. This is a can't miss match that sees the champions retain, but wow did they have to earn the victory! Kenou and Masa Kitamiya challenge the champs immediately after the match. Nakajima was challenged by the former Suzuki Gun member, Takashi Sugiura on Noah's last show and the champ backs down from no one. In a match that was off the charts, and had me convinced we were getting a new champion, the amazing Makajima pulled out the victory to retain the coveted GHC Heavyweight championship! This is another must see match from Pro Wrestling Noah, and if this is an example of what their "rebirth" is going to look like, then NOAH may be the best wrestling company on Earth!